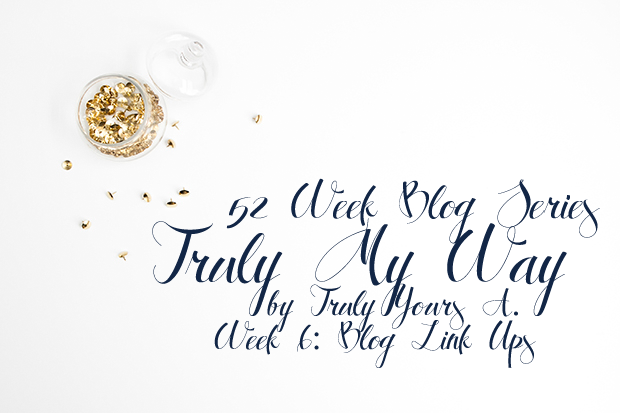 In case you missed last week's Truly My Way it was about StumbleUpon and how it increased my pageviews exponentially. This week is also about increasing pageviews and comments, but through blogging link ups. A blog link up is exactly what it sounds like: a place to insert your blog link and increase the post's exposure. Continue reading to check out some of my favorite link ups and how I used them. The first link up I discovered was on the Virginia Bloggers home page. Every Friday they host a Friday Favorites Link Up. The rules were super simple and I couldn't wait to add my post to the list. My Green & Gold outfit post was the first one I added and quickly became one of my more popular posts (based on pageviews). All I had to do was add the link to my post, select a photo and caption, add a link to VA Bloggers on my post and hit Enter! I plan on adding a post to this link up for as long as I can. I also enjoy reading and commenting on all of the other linked posts from my home state. I've recently discovered a few other link ups such as the "Currently" Link Up on Gold & Bloom, "Trend Spin" Link Up on The Fashion Canvas, and random link ups on The Peony Project. Choose an eye-catching photo. With most link ups you'll see the blog post's thumbnail before reading the title. You want your picture to instantly grab the reader's eye. Be generous. When you can follow the link up hosts and thank them for hosting the link up. You should also comment on as many blogs as you can. Don't worry if they'll return the favor; just think about how you would feel if someone left an encouraging comment on your post. Use them consistently. Some link ups will feature posts from the last week's entries. Consistently adding great content is sure to get you noticed. In conclusion, blog link ups are great for introducing your content to a wider audience and for finding new blogs to read. Tell me about a great link up you've found in the comments below! Great thoughts, I liked the idea of thanking the host, just like you would if you were invited to a party. I found a great link up for DIY projects recently, which is the focus of my blog, and saw a huge increase in traffic after linking up with them. I added a reminder to link up with them each week, so I wouldn't forget. What great advice! Link ups are such a great way to promote community among bloggers! Thanks for sharing.